What college football quarterback has thrown for the most yards in a game this season? Sam Darnold? Baker Mayfield? 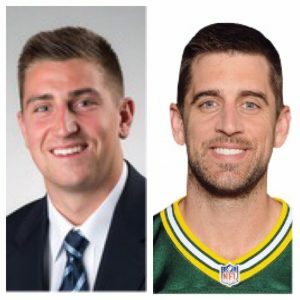 Josh Rosen? Luke Falk? What college football quarterback holds the Mid-American Conference record for passing yards in a game? Ben Roethlisberger? Chad Pennington? What UB quarterback holds the school record for passing yards in a game? Joe Licata? Drew Willy? The answer to all three questions is Drew Anderson. 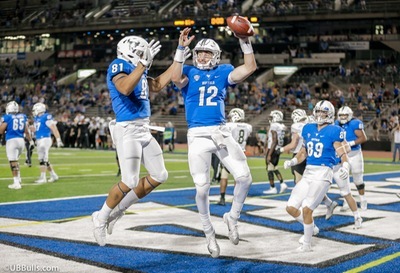 The UB junior from California burst onto the scene this past Saturday when he threw for 597 yards and 7 touchdowns in the Bulls 71-68 seven overtime loss to Western Michigan. I know the next question you’re asking. Where did he come from and how did he wind up at UB? Anderson is from Orinda, CA in Northern California near Oakland. He was injured and did not play high school football his junior year. So when he blew up as a senior throwing for 4000 yards and 47 TD, he was off the radar of college scouts. Without a scholarship offer, he walked on at San Diego State. That didn’t work out, so went he back to NoCal and played a season at Diablo Valley College near his hometown. A 33 TD season attracted the attention of UB coaches, who were already out west grabbing players like linebacker Khalil Hodge and cornerback Tatum Slack. So Anderson shows up at UB in January of 2016. He was the Bulls third-string signal caller last season. Anderson played in one game, and threw one pass. This season, he entered the season as the backup to budding star Tyree Jackson. But Anderson kept working, drew rave reviews from coaches, and shined during preseason scrimmages. But until Jackson injured his knee against Florida Atlantic, he was a mystery. Not anymore. In two full games and one half, he’s tossed 9 touchdowns with just one interception. The long journey (in miles and patience) has paid off. “It’s been a trying experience. It took a lot of patience and perseverance, for sure. My path was different from a lot of guys. But I wouldn’t trade it,” says Anderson. He will make his third start Saturday against Northern Illinois at UB Stadium. If you go, you’ll see a quarterback who is accurate, calm, mobile and savvy. Both come from Northern California. Neither received college scholarships coming out of college. Both burst onto the scene at FBS colleges. Yes, they even look alike. Drew Anderson is embarrassed by comparisons to Aaron Rodgers. But there is a similarity to their games, in the ability to do whatever it takes to help his team win. Anderson ran for an overtime touchdown, and even caught a two-point conversion score. He has been sacked only once. Rare air, even for a comparison. But rare air is where Drew Anderson is living right now.